NOVA SCOTIA (CelebrityAccess MediaWire) — John Allan Cameron, considered by many to be the godfather of Celtic music in Canada, died yesterday of bone-marrow cancer. He was 67. Born in Mabou, Cape Breton, on Dec. 16, 1938, Mr. Cameron started his musical career at age 12 by playing guitar at dances. He appeared on Singalong Jubilee and Ceilidh, and had his own series on CTV and CBC after the ordained Roman Catholic priest received a papal dispensation in 1964 so he could become a performer. He also released 10 albums and played around the world. Through his four-decade career, John Allan Cameron recorded 10 albums for such Canadian-based labels as Apex, MCA, Columbia, and his own Glencoe label. His repertoire included Cape Breton fiddler tunes, Scottish and Irish folk songs, bagpipe music adapted to guitar, and music by such Canadian songwriters as Bruce Cockburn, Stan Rogers and Bob Ruzicka. His stature in Celtic music circles in Canada was akin to that of American Bill Monroe in bluegrass music. 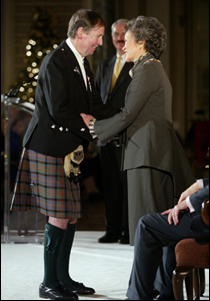 In 2003, Cameron received the Order of Canada for his lifetime contribution to the arts and his instrumental role in cultivating Celtic music in the country. Stewart MacNeil of the Barra MacNeils called Cameron a profound influence on a generation of Cape Breton entertainers. "For people like the Barra MacNeils and the Rankins and the Ashley MacIsaacs and Natalie MacMasters, I think he paved the way and let us know that our culture is something that has universal appeal,'' MacNeil told CP during a tour stop in British Columbia. Cameron's roots ran so deep in Cape Breton that many people assume he still lived on the East Coast, but in fact he, his wife Angela, and their only child Stuart had made their home in Pickering, Ont. Cameron's funeral is to be held Monday in Pickering, Ont.